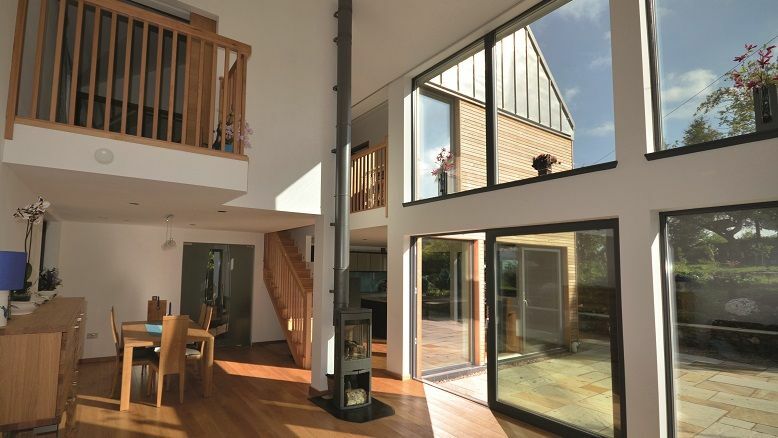 From the UK’s first PassivHaus for rent – which won a Green Apple Award – to examples that exceed the PassivHaus standard, Scotframe Timber Engineering has been leading the way in energy-efficient building for many years. A UK market leader in full timber frame packages for new housing and commercial projects, Scotframe exclusively offers the Val-U-Therm PLUS® closed panel building system, which can be used for walls, roofs and floors. The U-values achieved by Val-U-Therm PLUS® wall panels (0.08 W/m2K) are probably the best in the world. A key factor in achieving this extraordinary performance is that the insulation is injected in off-site, quality-controlled factory conditions. The foam expands into every nook and cranny, providing a best-in-class BR443 U-value correction factor of zero. PassivHaus requires the whole building envelope to work in unison – and this is where an integrated building system like Val-U-Therm PLUS® comes into its own, as it offers wall, floor and roof panels that have been thermally engineered to perform as an optimum combination. As well as excellent thermal insulation performance, details are available to minimise thermal bridging and give excellent airtight fabric levels. The Maryville PassivHaus in Loch Lomond and the Trossachs National Park delivered a total primary energy demand of 69 kWh/m2a (significantly exceeding the PassivHaus requirement of 120 kWh/m2a) using the ‘Fabric First’ thermal detailing offered by Scotframe. This is transported to site in flat-pack configuration and provides a “fit and forget” low maintenance thermal solution. The ‘Fabric First’ approach, which is also suitable for commercial buildings, achieved an air tightness of 0.475 ACH at the Rocking Horse Nursery at the University of Aberdeen, which caters for 78 pre-school children. Scotframe’s expertise really shines when it comes to offering buildings which are beautifully designed as well as technically excellent. The sky really is the limit when it comes to design – so not just boring rectangular boxes, but buildings that tick all the boxes in your clients’ wish lists. Scotframe homes and buildings are warm and draught-proof in winter, cool and well ventilated in summer, healthy for all the family and enjoy remarkably low energy bills. Scotframe Val-U-Therm PLUS® allows the construction of typical family homes that can cost less than £95 a year to heat. As well as design and quality, clients are also becoming increasingly interested in the environmental and sustainability credentials of building materials. Scotframe’s timber is sourced from sustainably managed forests governed by PEFC and FSC, and the insulation in Val-U-Therm PLUS® panels is fully recyclable and has zero ozone depletion potential. It is CFC, HFC and HCFC-free and has a Global Warming Potential of less than 5. This means it has a BRE Green Guide A/A+ Rating – the same as straw bales or sheep’s wool. All this makes a Scotframe kit an excellent choice for the environmentally conscious client or builder. The great news is that if an integrated building system like Scotframe Val-U-Therm PLUS® is used, building to PassivHaus standards is not necessarily more expensive or time consuming. One study by Edinburgh Napier University compared the cost per square metre of superstructure using 10 different building systems. Scotframe Val-U-Therm cost £1092 when built to PassivHaus standards, whilst the other nine systems ranged from £711 to £ 1138 when built only to existing Building Regulations. It took 65 days to build a Scotframe home to PassivHaus standards; the other 26 homes ranged from 49 to 126 days to build – but only to existing Building Regulations. The Scotframe Val-U-Therm® building system was originally launched in 2011 and has been used in over 8,000 homes with an excellent track record. It has been independently accredited by the British Board of Agrément, including verification of structural, fire and thermal performance, condensation risk, sound insulation and durability. It also has its own BBA Certificate 17/5421. It is accepted by financial institutions, NHBC and Premier Guarantee, and the panels have a 60-year minimum service life – twice the mortgage cycle. So for a high quality, energy efficient, green and beautifully designed PassivHaus home – think Scotframe Val-U-Therm PLUS®.